I’m just going to start with security because it’s probably one of the most common “arguments” we hear against moving to the cloud. The truth is when you move to the cloud, you will greatly enhance the security of your data immediately. Is your organization undergoing regular voluntary audits for SAS 70 certification? In an independent TechnoLawyer review of Nextpoint, Brett Burney said “… data is unquestionably more secure on the highly-encrypted, highly-secured server farms under Amazon’s watchful IT army than an old, out-dated server sitting in the broom closet of a law firm.” I concur. Even worse, are you letting people tote around sensitive client data on laptops and smart phones? We often hear law firm technologists claiming that storage is inexpensive. And it’s true that you can go to Best Buy and buy a Terabyte hard-drive for $99. It’s also true that a USB hard-drive with a terabyte of data on it is a disaster waiting to happen. If you take your data seriously, you know you need to have it geographically redundant, not simply backed up. You need it in a secure physical location at all times. You need RAID configurations. And the list goes on. We’re all aware that disasters happen, but there is no reason to put your business or livelihood at risk. Not when there are companies readily offering a service that will allow your business to be up and running from a hotel with a laptop. Internally at Nextpoint, I’m pretty certain people are tired of hearing me talk about scalability. I’m fascinated by Moore’s law which “describes a long-term trend in the history of computing hardware, in which the number of transistors that can be placed inexpensively on an integrated circuit has doubled approximately every two years.” In other words, computers double their power every two years. It’s incredible, and it also applies to storage. Some people interpret this to mean that storage and computational power are cheap, so they buy hardware. Unfortunately, what happens in practice is that we are creating exponentially more data every year to take advantage of that new power. Remember when Hotmail shocked the world with 50MB of free storage? I have 25GB of storage on my gmail account. If you buy X storage today, by the time you plug it in it’ll be too little and you will have paid twice as much as you would tomorrow. Spend all you like and you will get no closer to keeping pace. You are competing with Google, Amazon, and Microsoft. These companies are building physical data-centers with walls made of hardware. You can’t beat them… join them. Cloud computing is also sometimes referred to as utility computing. The key things to take away from that are that you can use as much as you’d like (scalability) and that you only pay for what you use. 200 years ago a factory might set up shop next to a river as a means to generate power. I’m not going to say that’s outdated or bad. With power I actually think it’s brilliant. Because it’s not likely that a company’s power needs will double every two years, so you likely won’t hit your limit. But with your computational needs, it’s unquestionably a bad idea as we explored in the scalability discussion. So here is the deal with cloud solutions. You pay for what you need and nothing more. Regardless of how the cloud service charges (by user, by data, or both) you will pay for only what you need. That means no large up front expenditures. And for you law firms, it probably means it’ll be easy for you to track your expenses directly to matters. It certainly does if you use Nextpoint. So not only is it less expensive, it’s easier to track and pass-through to customers. Put simply, you aren’t in the technology/software/IT business. We always say LLBL. Let Lawyers Be Lawyers. We’re happy to report that we got out of the email business a long while ago and went to the cloud. And you know, we got by okay before but Google is much better. We’d like to thank Dave Schaaf for documenting his experience moving from last generation litigation technology to the cloud. It’s a transition that we foresee everybody making soon enough, but he’s a trailblazer with a perspective that we value greatly. Thanks Dave! I’ve been involved in the legal industry for 7 years now, having started out with a jury research and trial consulting firm, before joining Nextpoint. With my old company, I learned the Trial Director platform, becoming a certified trainer, and using it while manning the “hot seat” on major trials. It was a bit cumbersome to learn, but I got to the point where it was a comfortable, albeit frequently frustrating application. Having this esoteric expertise was my livelihood, so I was not exactly open to changing to a new, unfamiliar technology. When I came to Nextpoint, the Trial Cloud, was in its infancy, and during my first trial with it we only used the deposition designation capabilities, which were amazing. It allowed members of the trial team to create and revise deposition designations, which I could then access to generate a cut list for the depo video, as well as PDF designation reports that could be exchanged with the other side. It represented a sea change from the old school methods of manually highlighting transcripts in various colors of highlighter, or typing in each page/line reference in an Excel spreadsheet. I was pretty impressed with this new web-based platform, but I had no idea the robust future it had. The next trial I worked on was the first where we used the document capabilities of the Trial Cloud. I had some trepidation with relying on something other than my trusty local Trial Director database. I could understand using it for designations, because the traditional methods were cumbersome, but Trial Director works fine. It’s comfortable (at least to the few people that have mastered it), it ain’t broke, so why fix it? I begrudgingly eased my way into using the Trial Cloud to manage the trial exhibits, so that other members of the team could access them as they were admitted, and I soon saw the advantages of having all the data available to the entire team via the Internet. My third trial using the Trial Cloud marked a significant advance. While the old guard such as Trial Director and Concordance were rolling out modest upgrades to their decade old platforms, Nextpoint was radically improving the capabilities of theirs. And the best part was that I didn’t need to install anything, I simply logged in and it was there. We had over a million pages of documents we needed to potentially access in court – enough to bog down my local Trial Director database to the point that searching for a particular Bates number could take five minutes, which is an eternity in court, and unacceptable when 100 people in a courtroom are staring at you to make something appear on the big screen. Fortunately, we were armed with a T1 connection in court, so after some frustrating, tense moments dealing with Trial Director I ventured into using the Theater component of the Trial Cloud to display my evidence in court. I was very skeptical that it could replace Trial Director. It didn’t have nearly as many bells and whistles. It seemed so basic. But I found that the brilliance of Theater is that Nextpoint took the few tools that you use 95% of the time in Trial Director, and incorporated them into Theater, and left out the superfluous stuff. 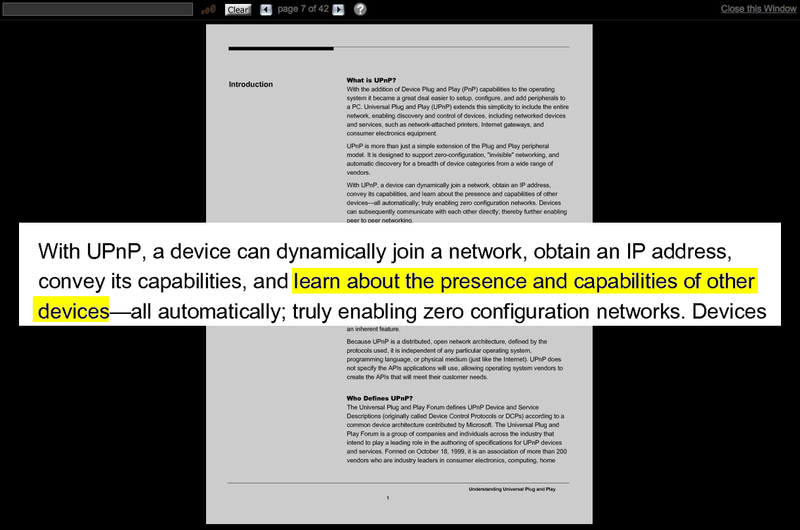 The result is that you have the ability to create call out zooms, highlight, underline and redact documents. You can save your treatments so that you can effortlessly recall them later. I have found that the simple functionality is much more user friendly than Trial Director, particularly when dealing with document treatments. In Trial Director, you must go through hoops to bounce between a document and it’s saved treatments, but with Theater, you simply type a single key to recall a treatment, and a single key to clear it. So much easier! Another immensely useful aspect of the Trial Cloud is how it makes collaboration so much easier. On my most recent trial, paralegals and associates were able to pre-treat the documents they wanted to use for witnesses, save all the treatments, and I was able to access them in court. True division of labor, rather than having multiple people stay up late to create them and add them to a local database. And when it came time to print exhibit binders for the jury, we simply exported the saved treatments, and included them in the binders (with permission from the judge) to direct their attention to the portions of the documents that we covered in the trial. I got to enjoy the capabilities of the Trial Cloud in courtrooms where we had Internet connections. You might not be so fortunate, but never fear, the Trial Cloud has wonderful exporting capabilities, so that you can prep your evidence in the Trial Cloud, then export it to a Trial Director database. But with more and more courtrooms going electronic, and allowing or even providing Internet connections, the Nextpoint Trial Cloud is the wave of the future. I think it’s human nature to fear change, to be averse to trying something new. But if you check out the Nextpoint Trial Cloud, I’m sure you will find as I did, that it is a major leap forward in evidence management and trial presentation technology. Give it a whirl! Dave Schaaf is a litigation technology expert for Nextpoint out of Los Angeles. He has extensive experience with evidence management, courtroom presentation, and trial demonstrative development. He’s manned the “hotseat” on major trials for clients such as Commerce Bank and ExxonMobil. If you’d like to get in touch, Dave can be reached at dschaaf at nextpoint dot com or simply by commenting on this post. Throughout the design and development of the Nextpoint review product, Discovery Cloud, our focus was on flow; paying special attention to the course of the review process. Production of responsive documents was certainly no exception. Our goals for production were to make sure that the process fits right into the review workflow, flexible yet anticipating your next move, and most important, ensure that what you’re producing is absolutely production ready. To begin a production export, from the review home page you can expand the “Responsive Documents” section and click on the “Production Ready” link. 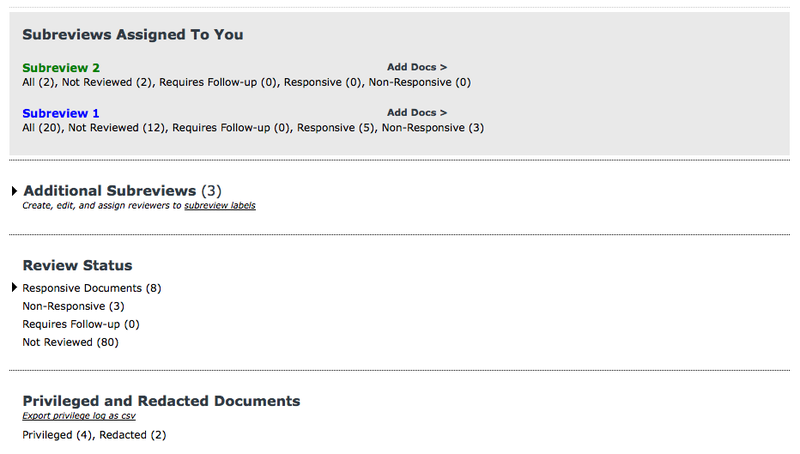 You can also drill down deeper and click on an individual responsive issue. Any one of the “Production Ready” links will take you to a list of non-privileged documents that are marked as responsive. 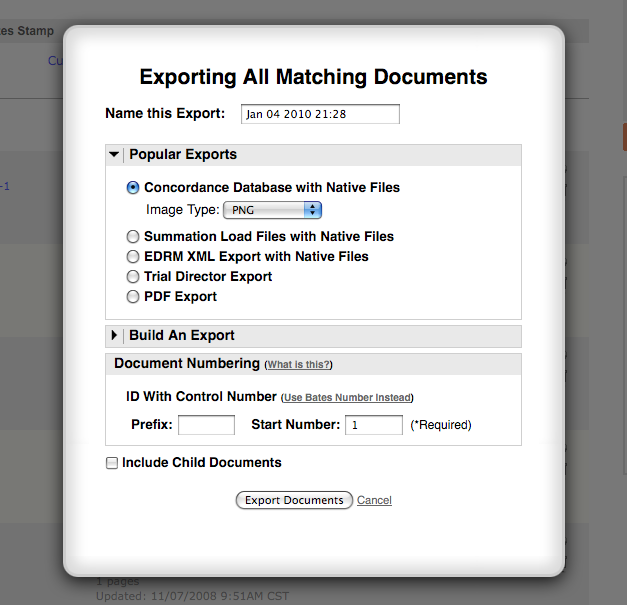 After you are sent to the list of documents, you’ll have a familiar export workflow. In the export window, we’ve defaulted some of the more “production-centric” options for you. We’ve defaulted to the bates numbering for document IDs in the export, and to include child documents only if they’re responsive and non-privileged. You can see that we offer all of the flexibility of our export interface, yet tailor it to be focused on your production so that it fits right into the flow of review. Adding to the recent improvements we’ve made to production exports, tonight we’ll be introducing a subtle but vastly improved redesign to the review landing page. We thought maybe it was feeling a bit too bulky and wanted to tighten up some of the design. So we reviewed it and reorganized it. We talked about the eye candy we could create with pie charts, or the benefits of bar graphs. We talked about what kind of counts would be beneficial to clients. We dropped the Production section and included it in an all new Review Status section, trimmed what we could from the pre-existing page, and focused on highlighting the most important information. 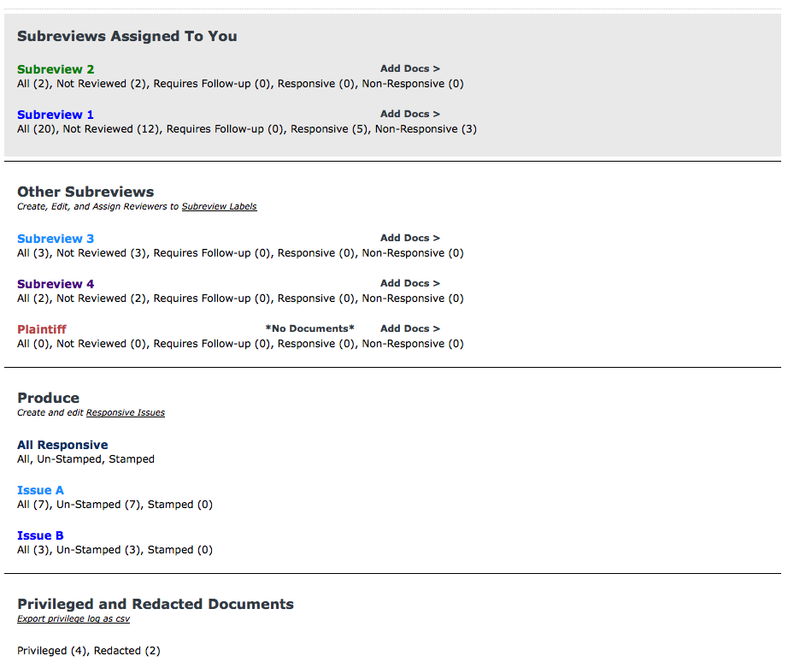 The Subreviews Assigned to You section provides a quick status of subreviews that a user/reviewer is working on. The Additional Subreviews section has been collapsed but provides the same level of detail for each subreview to users with advanced security privileges. Within these sections users are provided with links for basic filters so that they can resume reviewing non reviewed docs or inspect any of the other documents which already have a review status. 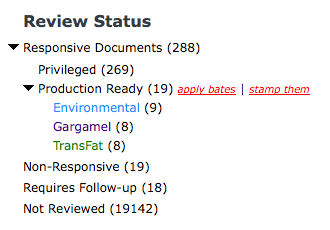 The new Review Status section provides a quick and powerful overview of the review as a whole. We’ve also provided a drill-down for Responsive Documents that shows how many of the documents marked as responsive are privileged and how many of them are Production Ready. 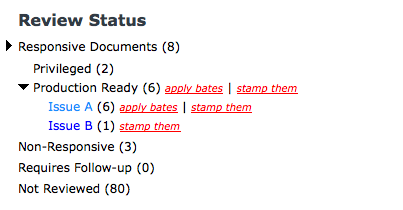 Clicking on the apply bates link will help assign bates numbers on documents without bates. Similarly clicking on the stamp them link begins the process of bates stamping documents. Finally, clicking on the Production Ready link begins the exporting/production process. You can also kick-off that process for individual responsive issues. The Privileged and Redacted Documents section provides easy access to documents that have been marked as privileged or have been redacted. You can also kick off the generation of a privilege log from this section. We hope you like the changes and welcome your feedback as always. Around here, we like to make sure you’ve got the tools to get at your data. After all, it’s yours, and you should be able to take it wherever you want to, with as little interference as possible. 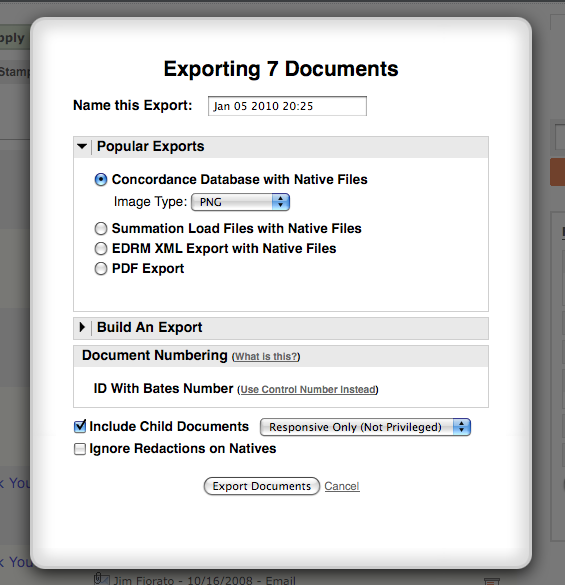 Our document export is a fantastic tool for getting at your data; letting you build export “recipes” using the load file, image type and native files as ingredients. 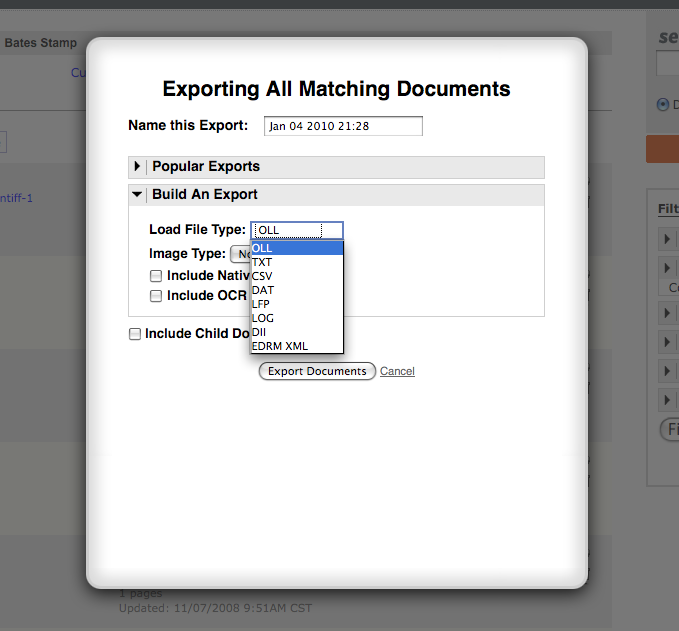 After fetching the set of documents you’d like to export using our sophisticated document search, you can choose to export them with one of our pre-built exports that are compatible with some of the most popular evidence systems out there. You’ve got your choice to produce images and natives, or just the native files themselves. Or if you like, you can do it Rachel Ray-style, and create your own export recipe. You’ve got your options for load file type, image type, whether or not you want natives or OCR. There’s oodles of options here for you to get your data in the format you need it, so start putting together your recipes and get cookin’!